Art centers add to a city’s “Cool Factor”. They add vitality to the city and its citizens as they nurture, support and promote the arts ! 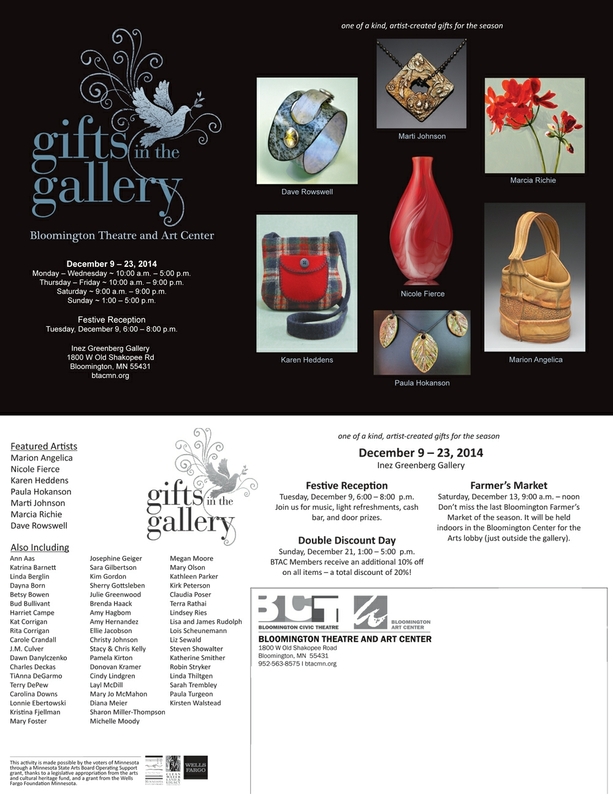 Here at Rawhide Studio we are all about promoting the arts so we were excited to be chosen as one of the featured artists in the annual Gifts in the Gallery show at the Bloomington Theatre and Art Center in Bloomington Minnesota. Proceeds from this show will go to help support new and ongoing programming in the arts at the BTAC. If you live in the area stop in to see the show and support your local art center! If you don’t live in the Bloomington area, be sure to support your local arts efforts and you will be part of maintaining the “Cool Factor” in your part of the world! Holiday Shows are around the corner! auntlianne on Ready, Set, GO!